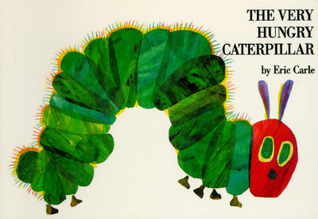 The Very Hungry Caterpillar is a much beloved book in our household (as you can tell by how well chewed up it is!). It has been a favorite of both my 5 year old daughter and 2 year old son. It’s a great book for practicing counting as the caterpillar eats his way through various numbers of foods, the bright colors are eye catching for the little ones and the little holes in each page are just fun for the kids to stick their fingers through. It’s a book that we have read over and over and over. Since my daughter constantly begs for crafts and experiments to do and I just happen to have a handy, empty egg carton we decided to make our own caterpillars. I just split it down the center so each of my kids could make one. I poked two holes in one end to stick a pipe cleaner through for the antennae and glued some googly eyes on. Then I just let the kids at it with paint. You can probably see that I use whatever is available to put the paint out and I find for crafts like this the top of the egg carton makes a handy paint tray that I don’t have to worry about washing out when we’re done. I did have to break out a tray as my 2 year old insisted on mixing all the colors together and my 5 year old wanted them separate. 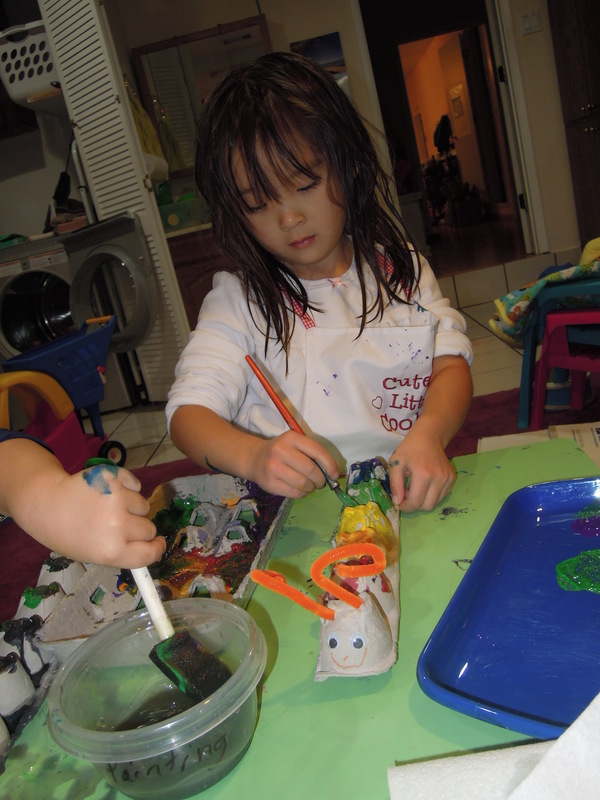 The kids were so proud of their caterpillars when they were done. 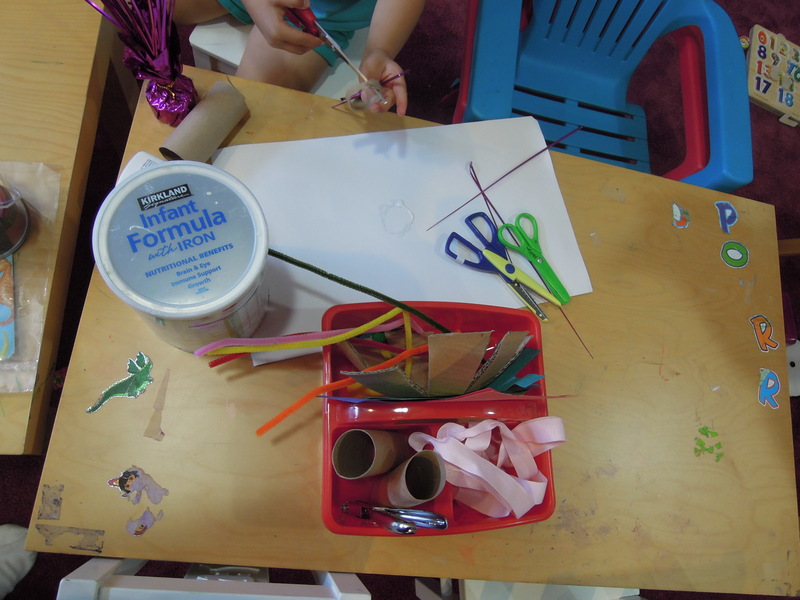 Ever since Earth Day and trying to think of ways to reuse items we would normally toss into the trash can or into our recycling bin I had been tossing around the idea of building “tinker lab” kits for my 4 year old. 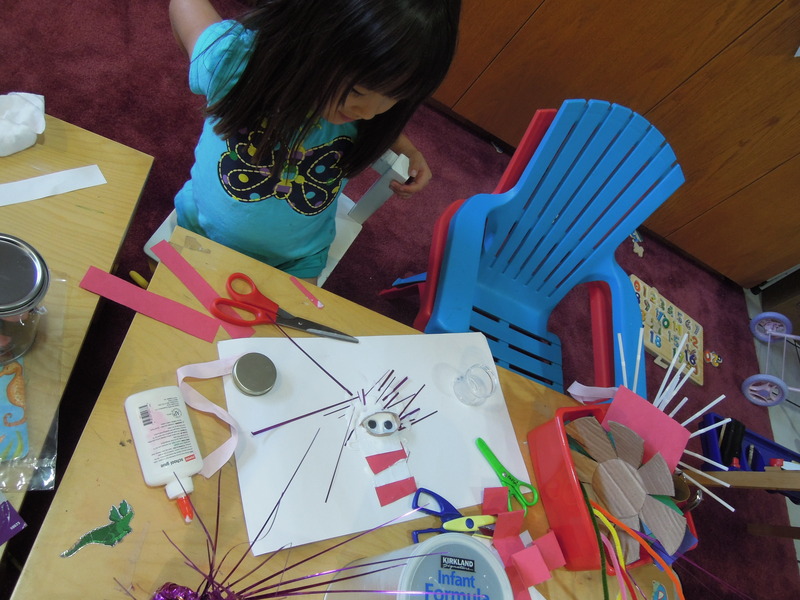 They are basically a bunch of items I set aside for future projects, scissors, glue and tape and instead of telling her what to do I just told her use her imagination and create whatever she wanted. I stepped back and just watched what she did without giving her any direction and she amazed me. 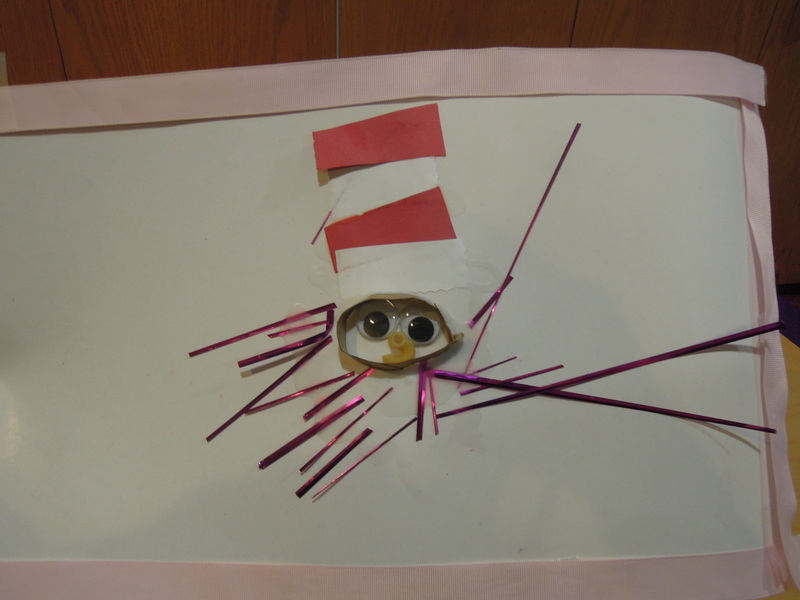 When she finally finished her Cat in the Hat she asked for my help in cutting the pink ribbon to “frame” her picture and she also requested some dried macaroni for the cat’s face but otherwise that was the extent of my help. I actually think she did a pretty darn good job making her Cat in the Hat from memory. Sometimes I get so caught up in creating projects for my daughter to do and telling her the steps that I forget just how creative kids can be when you let them be in the driver’s seat. 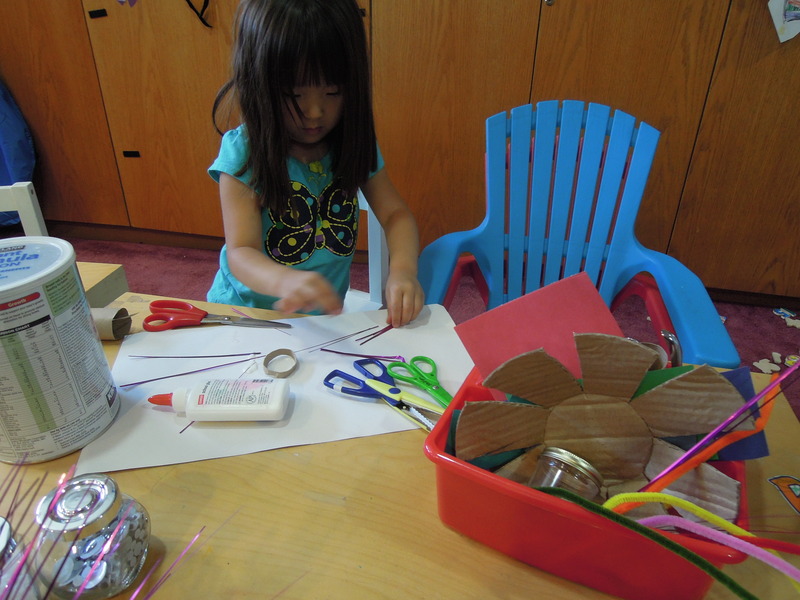 She enjoyed this tinker lab so much we did another one later that night with a robot theme (post on that will be coming) and we also painting a “flower” using some cardboard and a straw. She also cracked me up today when she decided she was going to tape this up on the wall and watch Cat in the Hat “on tv” and sat in a chair looking at her picture. I asked her if the Cat in the Hat show was interesting and she said “not really, he’s just staring at me.” LOL. It made me wonder what she was expecting or thinking when she did this. 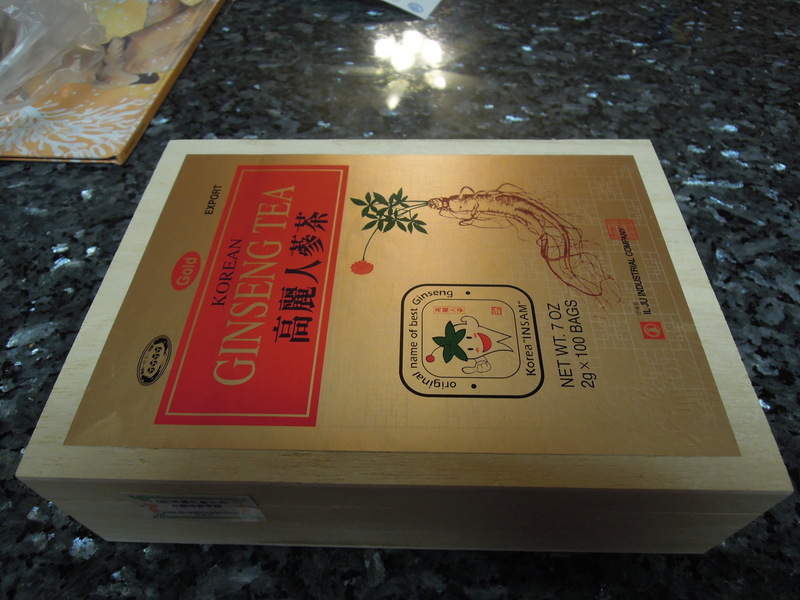 My husband bought some ginger tea that came in this pretty solid container that I knew was just waiting for an arts and crafts project for my four year old. 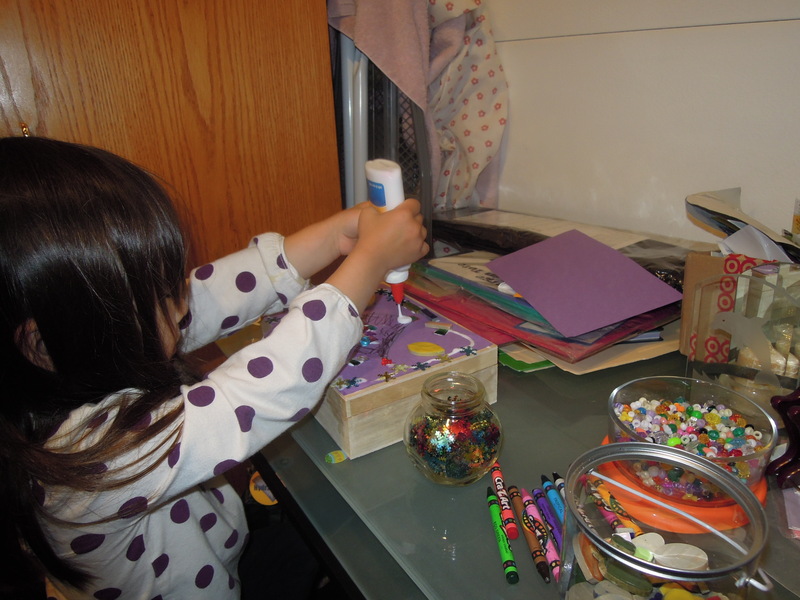 I had to do some work but I also needed to keep my daughter occupied so I whipped out this box and glued a piece of construction paper over the label on the box, laid out a bunch of random pieces of things she could use to decorate the box and a bottle of glue. 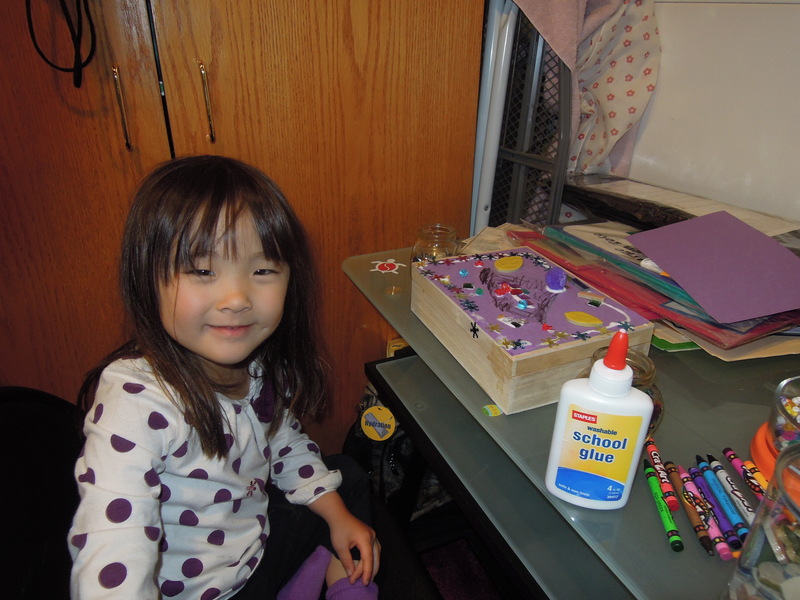 As expected there was heavy glue usage but she had a great time decorating. 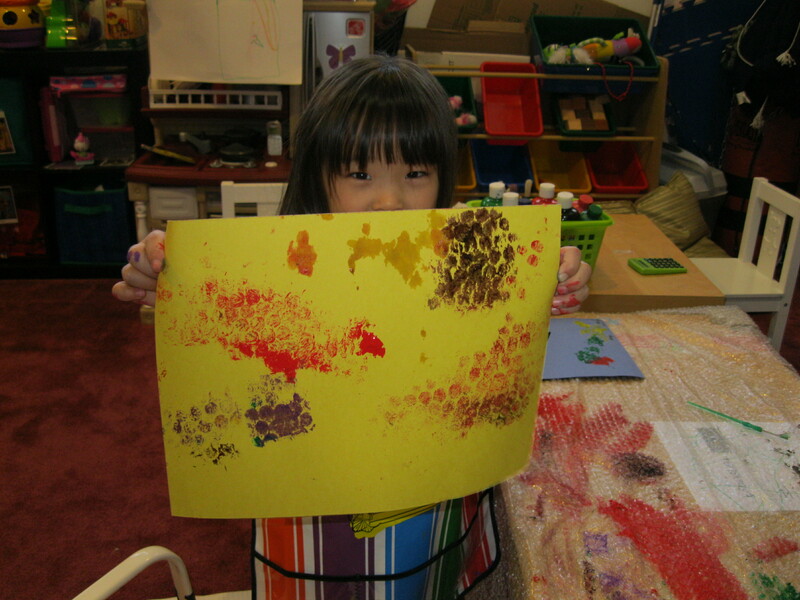 And she was very proud of the finished piece. Once everything dried she was excitedly running around the house picking out her favorite items that she wanted to store in her treasure box. I found it adorable that the first item was a picture of her cousin aka her “best friend”. One of the greatest things about this project was a) I didn’t have to buy anything for it. 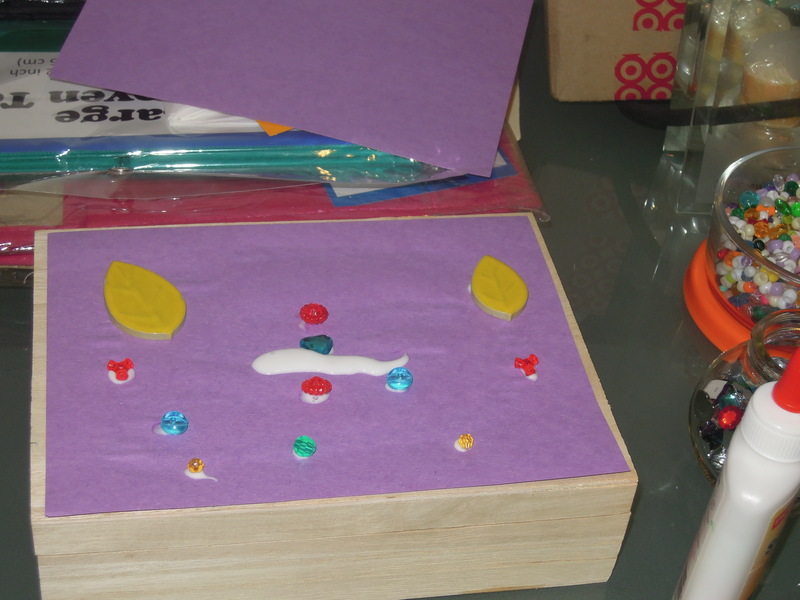 We had the box from the husband’s tea, the tiles, snowflakes, etc were all left over pieces from past projects or Christmas gifts, b) it definitely kept her busy while I got some work done and c) it was something my daughter could actually use. Last week a couple of my friends and I had a book swap/borrow play date in which we brought books our kids were either done with or wanted to share with their friends. 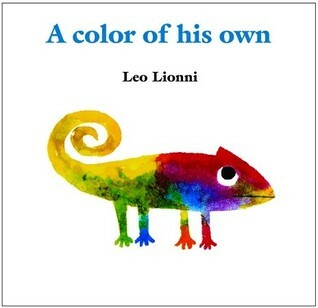 One of the books my daughter borrowed was A color of his own by Leo Lionni. It’s about how all the other animals have their own color like pigs are pink and elephants are gray but the chameleon doesn’t have a color of his own. Instead he becomes the color of whatever item he is near. We read it today and both my four year old and 19 month old really enjoyed it and in fact even after we were done my 19 month old kept picking it up to go through the pages. I enjoyed it because the art work was cute and reminded me of Eric Carle books and I am still working with my 19 month old on learning his colors. The only down side is some of the illustrations colors didn’t match the words. Like one animal was supposed to be red and both my kids said orange and honestly it did look orange to me. Same was true about a few other colors so hopefully it won’t confuse my son. 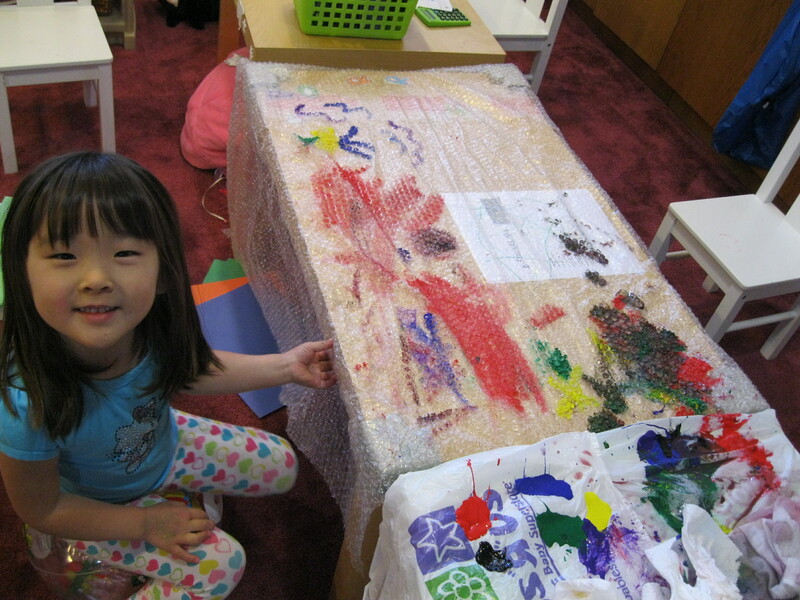 Since we were working on colors and my kids love art work when I discovered a bag full of bubble wrap while cleaning out a cabinet I decided why not let them try jumping on it. 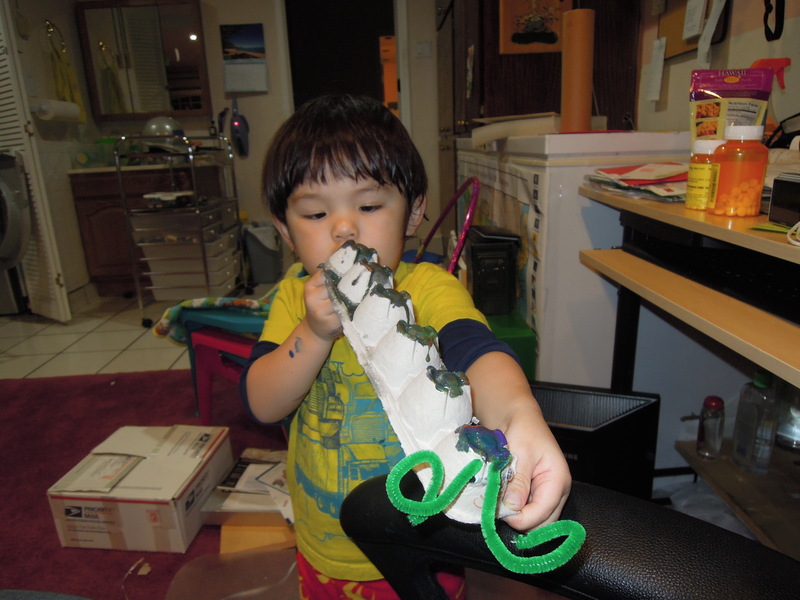 We had done that a couple weeks ago with the wrap with larger bubbles and they had a blast popping it all. These were tinier bubbles and definitely didn’t have as satisfying a pop so for plan B I laid a piece out on their table and taped it down. I usually use paper plates to put the paints out but since I was cleaning out our stash of plastic bags and planned on recycling a whole bunch I figured why not use those as a paint palette instead. 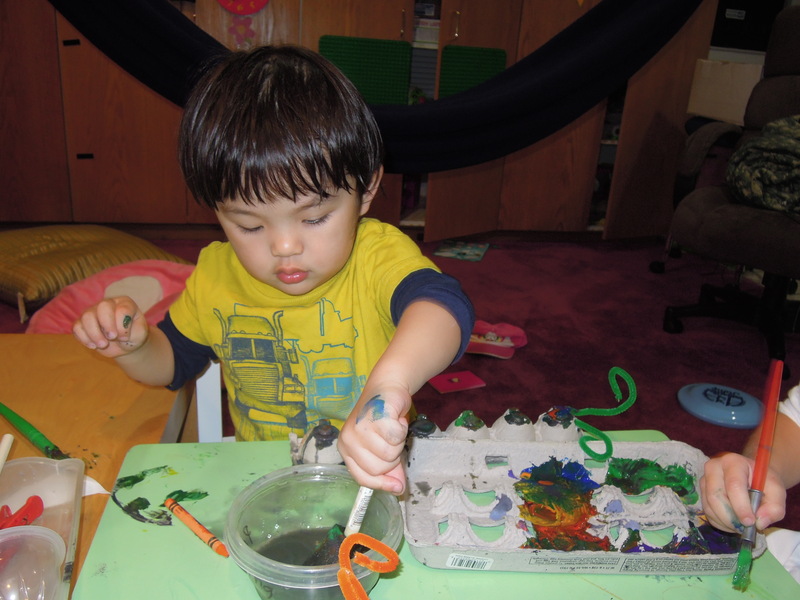 As I poured out each color I had my son call out the name of each color so we could get in some color practice. 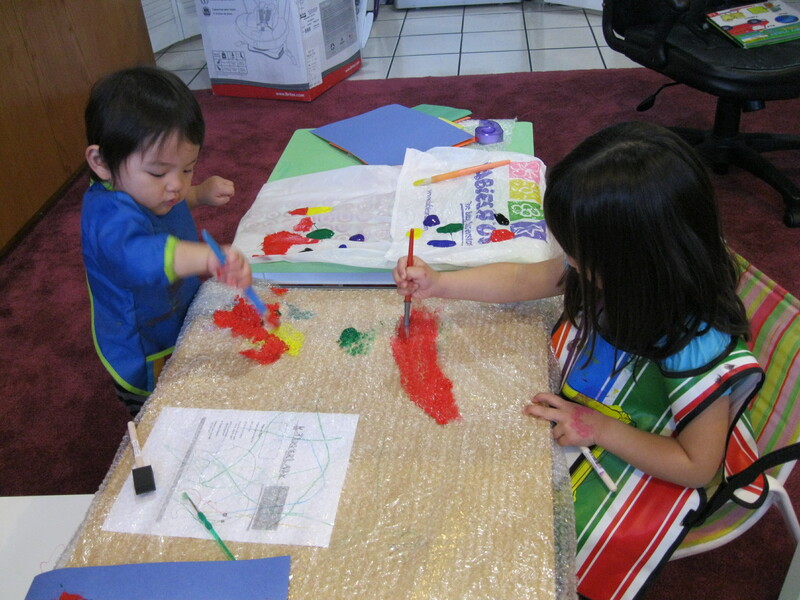 Then as you can see they went at it painting the bubble wrap and had a blast. 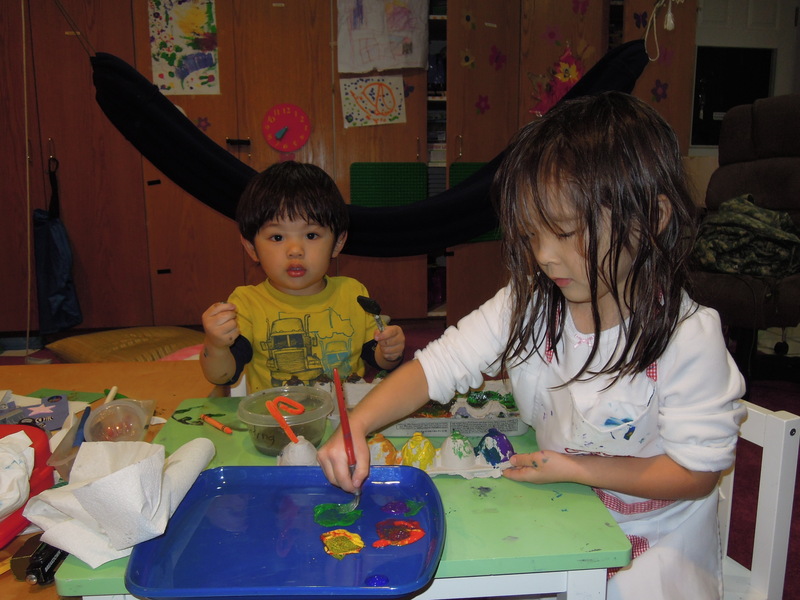 Once they were done painting a section I gave them a piece of construction paper to press down on their painting and see what kind of art work it created. Here is my daughter with one of her finished pieces. My daughter’s colors started blending together as her brush got all the paint colors mixed up so I got a bowl of water for them to rinse their brushes in. Of course then my son had more fun splashes around in the water bowl. 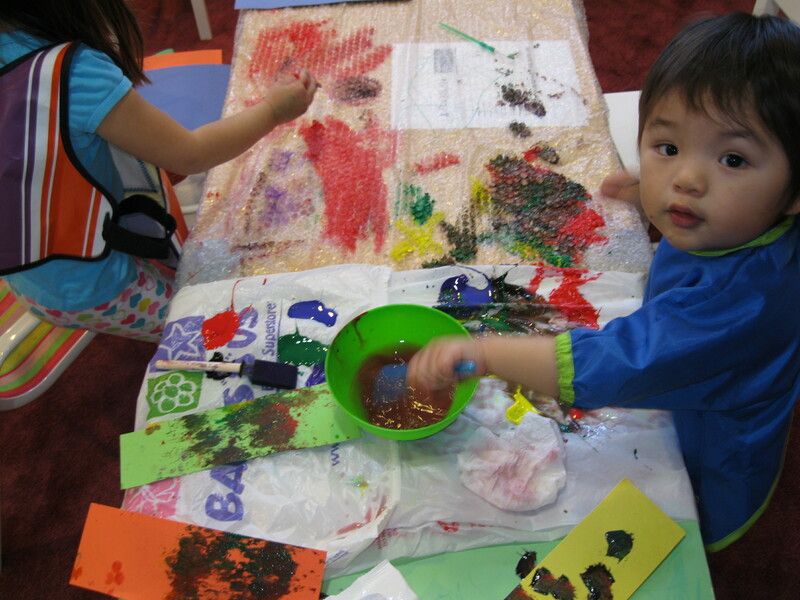 My daughter just enjoyed painting, painting and more painting until her side of the table was entirely covered. All in all a fun activity for the kids, it kept them occupied for awhile and I got to get in a little color practice for my son and it didn’t cost me anything extra since I hadn’t even realized we had this bubble wrap saved from some package delivery.